And now we have the crown jewel of the BOOM! Kids collection. 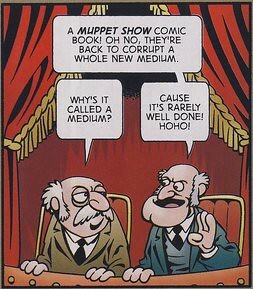 The Muppets franchise has successfully used many different platforms- film, animation, and even comic books. But not one of these various spin-offs has ever topped the original show. The series' freewheeling fun and variety remained unduplicated. The first movie came close (and featured one of the greatest special effects ever committed to film), but ultimately the conventional story requirements of a feature film couldn't match the manic energy of the television series. Roger Langridge now steps up and attempts to deliver a comic book worthy of Jim Henson's legacy. Not just worthy of the entire Muppet franchise, which has seen it's ups and downs, but specifically the lightning in a bottle charm of the original show. Packed into one issue are all the familiar characters, plenty of sight gags, a song or two, and Pigs In Space. There's also an ongoing backstage tale concerning a mystery that's troubling Kermit The Frog. In short, the comic plays out as any classic episode would. Earlier this week I talked about how cool it was that the BOOM! Kids titles were getting newsstand distribution. Another old fashioned method they're employing is subscription service. Now this is usually unheard of in the financially uncertain world of independent comics. But I guess when Disney has your back you can afford to guarantee a full series run. You can subscribe to THE MUPPET SHOW, THE INCREDIBLES or THE WORLD OF CARS through BOOM! 's website right here. Which is kind of great because what kid doesn't like having something show up in the mail box for them? That Beauregard/George panel is the lawls. 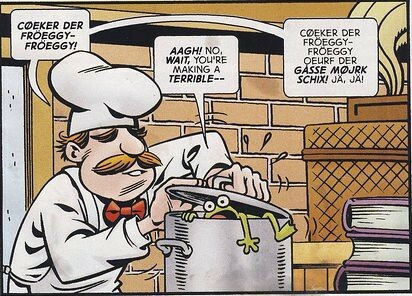 And whoa, is Swedish Chef trying to cook Robin? Of course. Kermit would never fit into that pot. I proudly downlo-IMEAAANNN bought the first issue! BRavo!